Locations of >10,000 earthquakes on the Endeavour segment of the Juan de Fuca Ridge from the work of Robert Weekly. About a decade ago, the W.M. 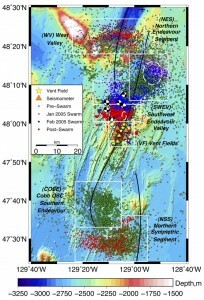 Keck Foundation funded a group led by John Delaney to conduct prototype seafloor observatory experiments to monitor the relationships between episodic deformation, fluid venting and microbial productivity on the Endeavour segment of the Juan de Fuca Ridge and at the intersection of the Nootka fault and the Cascadia subduction zone. At the Endeavour, the experiment was sited on the central portion of the segment in a region where the spreading axis is characterized by a 100-m-deep, 500-m-wide axial valley that hosts five high-temperature hydrothermal vent fields spaced 2-3 km apart. The objectives of the experiment were to develop experiments to monitor local and regional seismicity around the vent fields in conjunction with the deployment of sensors and samplers to monitor temporal variations in the physical, chemical and ultimately microbial characteristics of the hydrothermal fluids. The seismic network was a collaboration of the University of Washington, University of Oregon(Doug Toomey and Emilie Hooft) and Monterey Aquarium Research Institute (Paul McGill and Debra Stakes). 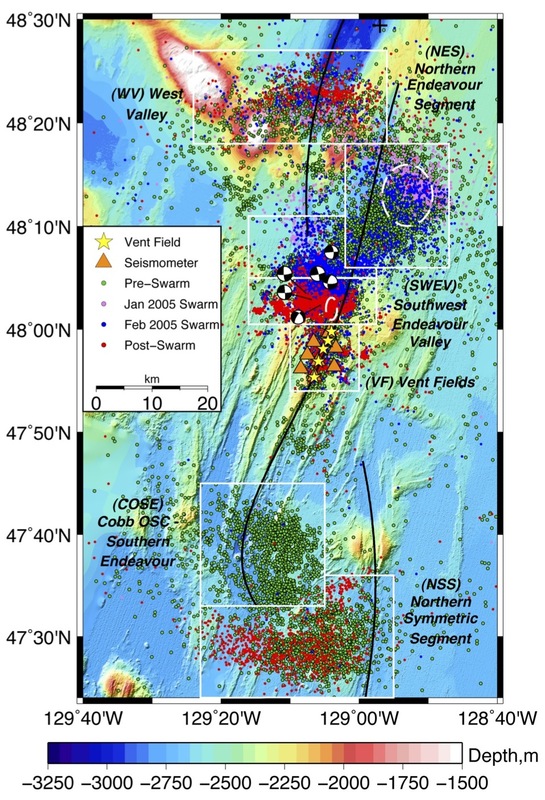 Over its 3-years of operation, the Keck Endeavour seismic network located over 10,000 earthquakes associated with seafloor spreading including large swarms in January and February 2005 that have been interpreted as volcanic intrusions. Following these swarms the rates of seismicity along the whole Endeavour segment decreased nearly everywhere to ~15% of pre-swarm levels including regions to the south that are tens of kilometers away from the swarms themselves. Vertical section across the central Endeavour showing earthquakes with focal mechanisms (red = extension and blue = compression) that are modeled by the inflation of horizontal crack. 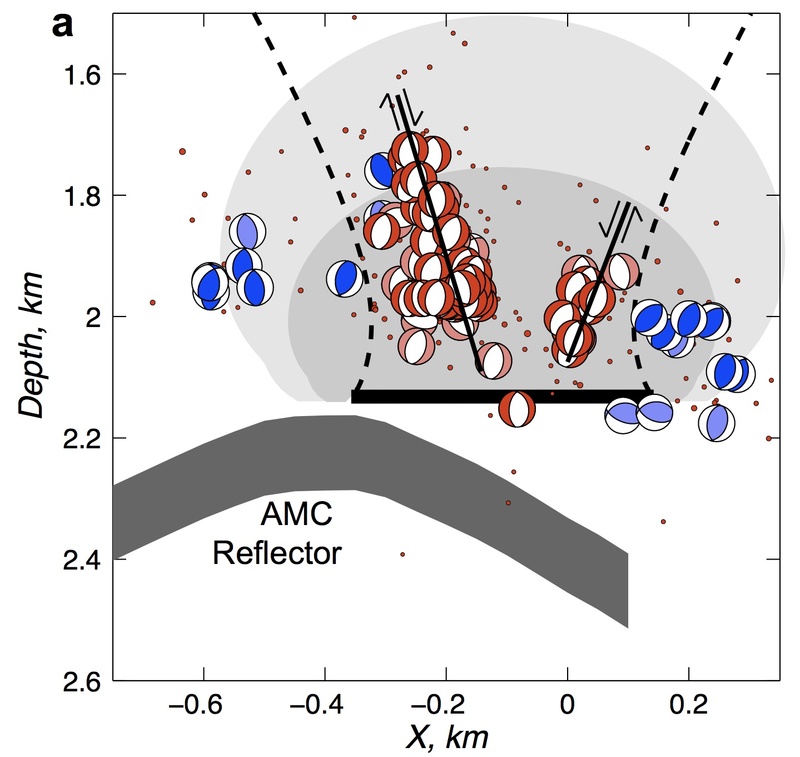 Beneath the hydrothermal vent fields of the central Endeavour the earthquakes are located just above an axial magma chamber that was discovered by seismic reflection studies. Beneath the most vigorous hydrothermal fields earthquakes indicative of extension across the axial valley are flanked by earthquakes indicative of compression. This striking pattern is consistent with the stresses that would result from the inflation of an axial magma chamber and is evidence the spectacular hydrothermal vent fields of the Endeavour are powered by the ongoing magma recharge. I hope that the automatic earthquake location techniques developed by my former student Robert Weekly for this project with support from the National Science Foundation will be applied to real time data that will soon flow from the NEPTUNE US observatory on Axial Seamount and the NEPTUNE Canada cabled observatory on the Endeavour segment where the seismic network remains to be completed.